Most people are familiar with the more “recent” public life aspects of Kate's life including the invention of, and being owner of the company which was responsible for the development of “Shrinky Dinks.” The company was started in 1973 and she stayed with it until 1992. Others know her because of her long stint in public service where between 1982 and 1986 she served as Alderman with the City of Brookfield. This turned into a 16-year term of service as Mayor of the City before retiring in 2002. Kate loved the job and the all the terrific folks with whom she served including Employees, Aldermen, Mayors and Village Presidents of other communities. She enjoyed the Village President of Elm Grove enough to marry Dr. Frank Urban in 1991 which brought the grand total of kids and step-kids to 11 along with 28 grandkids. Sadly, Frank or “Hank” as he was known, passed away in 2008. The lesser know facts of Kate's life include being born and raised in the Upper Peninsula of Michigan which makes her a UPer, and with no indoor plumbing until she was 16 makes me a true UPer! Kate attended Knox College in Galesburg, Illinois where they did have indoor plumbing before moving to Massachusetts to teach and run a Children’s Summer Theater and Camp. She was married during this time and had 4 children who are now completely raised, on their own and producing a lot of grandkids. Originally from the New York Long Island area, Tom grew up with a sister and two brothers. After graduating from the State University of New York College at Plattsburgh, he worked for a few years in the Outdoor Advertising industry in New York before relocating to the Milwaukee area in 1983 to work for Clear Channel Outdoor. Tom's wife Julie and he currently live in Brookfield and while he didn't have any children from his first marriage (also to a woman named Julie), he now enjoys being a grandparent to 9 grandchildren as a result to his current marriage and his wife who has three adult children. Clear Channel is an outdoor advertising company operating worldwide and Tom serves as Import Sales Manager. He works on sales coming to the Milwaukee market from National and branch offices across the country. As an active member of Cross of Life Lutheran Church in Brookfield and a board member of the Potawatomi Area Council Boy Scouts of America, He's participated in many service opportunities over the years. 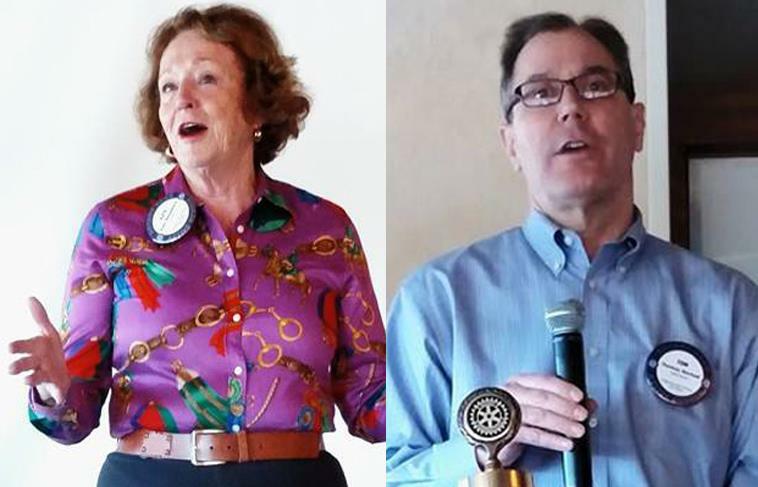 Although he was asked by a few members over the past several years about joining, it wasn’t until recently that he felt ready to make the commitment to Rotary. Tom is pleased to be a new member and looks forward to the fellowship among members and the variety of opportunities to serve. Welcome Kate and Tom – glad to have you both in the club!